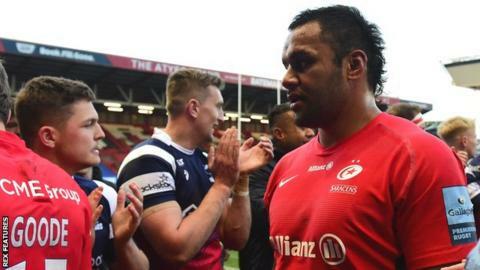 Billy Vunipola has been given a "formal warning" by the Rugby Football Union after the England player defended Israel Folau's social media post claiming "hell awaits" gay people. The 26-year-old number eight liked the post by Folau and called for people to "live their lives how God intended". Vunipola, who has also been warned by his club Saracens, has been "reminded of his responsibilities" by the RFU. During a meeting, the RFU said Vunipola had "expressed genuine regret". "The warning will be retained on his disciplinary record for a period of five years and may be taken into account in future disciplinary proceedings," the RFU said in a statement. Vunipola released his own statement on Monday saying he had not intended to "cause suffering". "I can see that my recent post has hurt people," said the Sarries forward. "My intention was to express my belief in the word of God. "These beliefs are a source of great strength, comfort and guidance in my life. Anyone who knows me, knows I live with kindness and love towards ALL people." Folau's contract was terminated by Rugby Australia because of a "high-level breach" of his code of conduct. Sarries director of rugby Mark McCall said the controversy has been "a distraction", and is "thankful the club and RFU have acted quickly". "He's obviously had a challenging few days," McCall told BBC Sport. "As a team we see the matter as having been dealt with and we want to talk about the rugby and concentrate on the rugby." Danny Care says personal beliefs won't get in the way of wanting to win rugby matches.